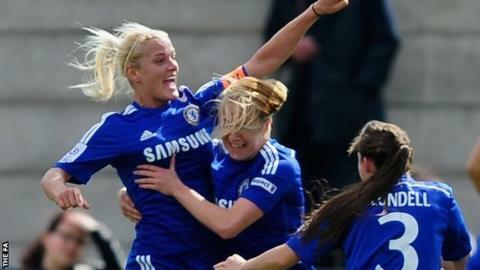 Chelsea have reached the semi-finals of the FA Women's Cup with victory over holders Arsenal. Two former Gunners gave the visitors the lead, as Katie Chapman headed Chelsea in front before Gemma Davison doubled their advantage. Left-back Emma Mitchell's wonder strike halved the deficit before the break to give Arsenal hope. The Blues however held on to progress to the semi-finals for the third time in four seasons. Chelsea, who lead the Women's Super League 1 table with two wins from two games, started full of confidence and Eniola Aluko narrowly dragged a shot wide early on. They took the lead after 17 minutes when captain Chapman rose to head home a Ji So-Yun corner. England winger Davison then smashed into the top corner for her fifth goal in just four games since signing from league champions Liverpool. All three of the goals Arsenal have conceded so far this season have been scored by former players, with Ellen White netting against them for Notts County in the league. Arsenal, Cup winners on a record 13 occasions, looked second best throughout the first half, but were given a lifeline when Mitchell pulled a goal back with a fierce, dipping, long-range strike from wide on the left-hand touchline. Emma Byrne produced a brave, quick-reaction save to deny Aluko from two yards and keep the hosts' hopes of a comeback alive. A neat Arsenal move presented Jordan Nobbs with a chance, but her effort was blocked by Chelsea's Millie Bright, and that was as close as the Gunners came to an equaliser. "We are really happy with the character shown by the girls today. "Arsenal are a side with a lot of experienced players and a history of winning cup competitions. "To show the determination to get the result that we did, we're delighted." "I think the game came too early for us. It's difficult to prepare when you have players away with international commitments, but it's something we have to accept. "I don't like to give any excuses about performance but our players looked exhausted. "We want to play football but, when the other team is pressing well, it is difficult to find spaces." Arsenal: Byrne, Scott, Mitchell, Stoney, Losada, Nobbs, Carter, Smith (capt), Williamson, Natalia, Rose. Substitutes: Chamberlain, Sanderson, Ubogagu, Weir, Humphrey. Chelsea: Lindahl, Blundell, Bright, Fahey, Davison, Aluko, Ji So-yu, Rafferty, Chapman (capt), Coombs, Spence. Substitutes: Hourihan, Groenen, Flaherty, Borges, Banusic.